The best school curriculum is the one that continuously evolves, while remaining steadfast to its principles. The purpose for an evolving curriculum is about keeping abreast of the best research in child development and educational studies; staying current with updated materials; and the ever-shifting methodologies that flow from new technologies. However, the basic preparatory goals remain the same: we want to advance our students in the areas of math, science, reading, writing, Hebrew, Judaic Studies, history, social studies, music, art, and computers in ways that are active, creative, and engaging. We seek to provide the strongest comprehensive education possible so that our graduating fifth-grade students are ready to take on the most challenging middle-school curricula offered in the most rigorous programs in the city. What pervades our teaching is the interest we place on developing in each child the mind, the emotions, the body, and the spirit. We keep a vigilant eye on what is happening around the country in the best middle-school programs so that we can tweak our curriculum wherever necessary, and tweak our teaching approach, to prepare our kids in the best ways possible, investing in them the habits and the values that will have a lasting, positive impact. Through a balanced literacy approach Beth Yeshurun Day School’s English Language Arts program prepares students to be formidable, independent readers, writers and critical thinkers. The ELA curriculum is designed to develop skilled readers and writers. We have an integrated approach to ELA. Small group and whole group instruction allows each child to meet his and her goals. We believe that inspiring our students to make connections across disciplines, to ask questions, and seek solutions. This approach produces creative independent thinkers. They learn by asking, thinking and creating. In addition, public speaking an ongoing skill is encouraged and demonstrated throughout the years. Reading includes literature of a variety of genres and informational text. Our students develop into engaged readers and create a community for enjoyment, knowledge, and inspiration. In the younger grades, phonics and guided reading is taught. The upper grades focus, book clubs gives our students an opportunity to build relationships, demonstrate ingenuity, teamwork and mental agility. Writing is the art of language. It helps us think through, organize and communicate our thoughts, ideas and opinions. Our writers transfer their knowledge, emotions and ideas into their own words. Writing gives our students an opportunity to exercise a writer’s voice, use the mechanical skills of writing and engage in the higher- level thinking skills of reading. Our students write to display knowledge, responses, reflections, ideas and interpretations. Active journaling across the disciplines gives teachers insight and a more exact picture of student’s comprehension and understanding of any concept. Beth Yeshurun Day School uses a math program based on the way math is taught in Singapore. This program is designed to equip students with a strong foundation in mathematics using a concrete-pictorial-abstract approach. Singapore math generally focuses on fewer topics but in greater depth. Students don’t just learn equations to reach an answer; they learn how the equation works. The program aims to teach mathematical concepts in a step-by-step process of deep understanding, instead of relying on simple and formulas. Mathematics in Singapore is not about knowing everything. It’s about thinking like a mathematician. Effort and perseverance is encouraged as children work similar problems in different ways. Our curriculum helps to promote and develop logical thinking and stresses problem solving skills. Concepts are taught to mastery and consecutive grades will then build on the previous year’s concepts creating a spiral progression. Topics covered in previous grades are reviewed in higher grades with increasing difficulty. This core curriculum is used as a foundation in each grade along with other tools and projects to supplement the students’ learning. In our social studies program students develop knowledge of the world as a global community. They begin learning about their neighborhood in Kindergarten and expand as they progress through the grade levels to our city, our state, our country, and the world as a whole. The content is presented in units that focus on geography, history, economics, political systems, and cultures. As a part of our commitment to the state of Israel, we strive to help students understand the impact that Jewish people have had throughout history. We study Jews in our community, city, state, country, and the world that are making a difference. We also study migratory patterns of Jews throughout history and how that has impacted the nations in which we live and have lived. We realize that only .2% of the world is Jewish, yet a disproportionate number of us have achieved the highest levels of fame in their fields of literature, science, art, music, finance, and medicine. At BYDS we study the reasons for these statistics and instill in our students the value of being among these special few. Our social studies program provides students with opportunities to read and interpret problems, identify cause and effects, and make informed decisions. Students are taught to use primary and secondary sources of information and to summarize main points of an issue from different viewpoints. We strive to instill a global awareness in our students that will inspire them to want to be philanthropists and social activists to make the world a better place. The development of STEAM (science, technology, engineering, art, and math) proficient students begins in elementary school, and at BYDS, our Elementary School science classes integrate additional STEAM projects into our already vigorous FOSS curriculum. We have found the best way for our students to appreciate scientific exploration, learn important scientific and engineering concepts, and develop the ability to think critically is to actively participate in their own investigations and analyses. Our students conduct experiments and document their findings while studying physical, earth, and life sciences. Our new makerspace-style Science labs allow for more time and space for our students to grow through project-based learning. Students visit the STEAM Lab at least once a week where they engage in self-directed study and practice the skills of observation, measurement, classification, interpreting data, making models, and coding. 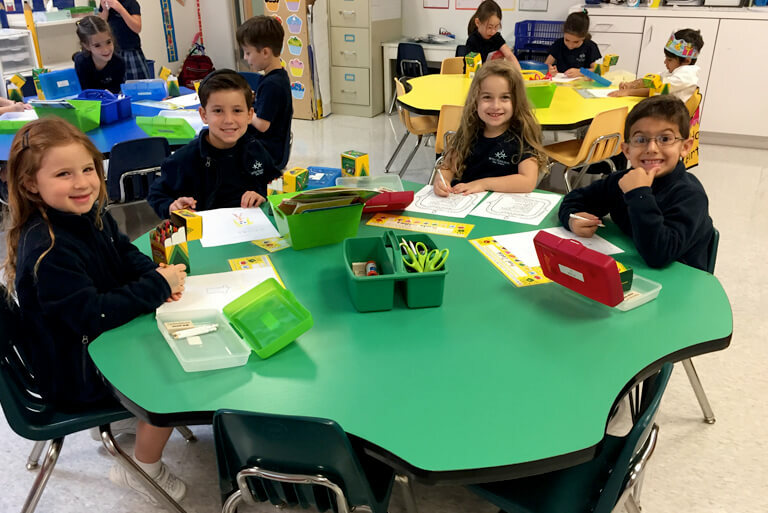 In addition to Science lab time, Kindergarten through 3rd grade students spend time in their homerooms reading, playing games, and doing activities that support the activities done in the Science Labs. Each Spring, the 4th and 5th grade students and many of the early elementary students participate in Science Fair for which they must choose their own topic, then research, plan, experiment, document, and present their findings to the other students as well as family and friends during our school-wide Family Science Night. Our Judaic Studies curriculum is designed to promote the knowledge, ethics, and commitment to Jewish life, ideals and values through the acquisition of the Hebrew language and exploration of Jewish concepts, themes, and traditional texts. The program is organized around our students developing a personal connection to Text, holidays, prayer, and G-d, to the Kehila (our community), and to the Land of Israel. BYDS promoted Jewish values and concepts through genuine experiential and learning activities as well as authentic celebrations of Jewish lifecycle events throughout the year. Hebrew language exposure incorporates a strong spiral curriculum based on the 5 Cs of the World-Readiness for learning languages: Communication, Cultures, Connections, Comparisons and Communities. Our mission is to teach traditional knowledge and promote meaningful experiences. We promote pride in our Jewish heritage and commitment to our people and moral principles.